St.Petersburg is the most beautiful city in Russia and one of the most beautiful in Europe. Culturally, historically and architecturally it’s the most European Russian city though it’s very different from any other city in Europe. Sometimes it’s called Northern Venice for its multiple channels and rivers or Northern Palmira for its beauty and grace. One of the youngest European cities in its 316 years of history St.Petersburg has seen many tragic and dramatic events. City with great history and culture where everybody will find something to his/her liking. We hope our Ultimate St.Petersburg city guide will help you to plan your trip and to get the most out of your time here. P.S. Many thanks to all my friends who helped me to write this post, shared their ideas and gave many useful tips! For those who’d like to see more of Russia and to visit some difficult to access far away place there are several unique tour options with G-Adventures that will make your holiday unforgettable. Traveling includes different kind of risks from a flight delay or cancellation to medical emergencies and credit card, documents or baggage loss. It’s always advisable to have a travel insurance that will cover you in case if something goes wrong especially if you venture to a far away country like Russia and are planning to move around a lot. 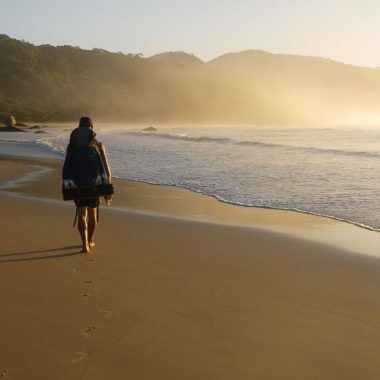 Let your insurance company worry about you while you exploring new horizons. World Nomads insurance company operates all over the world, their travel insurance covers pretty much any emergency that can happen to you on a tip. It doesn’t matter where you live or where you are at the moment, it takes less than 2 minutes to get a quote, you can buy it online even if you are already traveling. Note! Always read the small print and be sure you buy the correct policy. *All suggested below places have Excellent rating and very central location which is important when you stay in a big city. In general summer (June, July, August) is the best. Though with our Northern summer you can never be 100% sure about the weather but at least long days (so-called White Nights) will help you to extend your limited time in the city quite a lot. With average temperature ranging between 15°C – 25°C it’s comfortable for long walks and boat rides in the city. September so-called Babye Leto (Indian Summer) the weather is often better than in August and the holiday season is over so it’s less crowded than in June or July. But the days are getting shorter you can almost forget about famous White nights. If you’re a culture vulture and rather have bad weather and less tourists late September-October and April-first half of May are better months for you, there are not too many tourists like in summer, it’s not too cold (between 8°C and 12°C), you get a chance to explore quietly the main city attractions. My favorite time in the city with its peak in the mid June (night from 21st to 22nd is the shortest night) when the city doesn’t sleep! It feels like you can sleep 4 hours a day and it’s enough. The weather in June can vary from cold 15°C to warm 22°C, rains are quite frequent. The only downside of White nights is too many tourists and multiple forums, exhibitions and events. If you do want to come in June make sure to book accommodation in advance. It’s 3.30am short summer night is over. You can get anywhere by public transport; around the city, to/from the airport and to the main suburbs. There are usually several options. Most places (hostels, shops, restaurants, cafes, metro etc.) accept Visa/Master cards. Note! On buses/trams/marshrutkas (commercial mini buses) you pay cash. If you don’t speak Russian you’ll definitely survive here even if you get lost just try to ask for help younger people you have better chance they speak any English. Google translate works quite good for English-Russian, Campbell used it a lot and could even hold a basic conversation. The city is quite safe. In all my life I have never had any bad experience here. Normal precautions; watch for pickpockets, don’t walk alone at night on the outskirts (there is nothing to do there for you anyway), don’t leave your things unattended in public places. There are many churches/cathedrals in the city most of them are functioning before you enter you have to; for women – cover your head/for men – take off cap/hat. It’s better to draw money in ATMs of big international banks (Raiffaisen, City bank etc.) there you can get up to RUB50 000/US$850. Wi-fi is quite common in the city, all hotels/hostels most restaurants and coffee shops have free wi-fi. Though sometimes to connect to wi-fi in public places you need a local phone number. Recommended books and guidebooks; Lonely Planet St Petersburg, Lonely Planet Russia, Lonely Planet Russian Phrasebook & Dictionary, St. Petersburg: Madness, Murder, and Art on the Banks of the Neva by Jonathan Miles. Campbell at 4am on Palace Square with Hermitage on the background. St.Petersburg city guide. Backpacking: accommodation (hostels) – from RUB350/US$6 pp; food (meal) – from RUB200/US$3 pp; food (shopping) – from RUB300/US$5 pp; transport (public) – RUB45/US$0,7 per trip, activities (museums, boat rides, entrance fees) – from RUB700/US$11,5 pp. Middle price range: accommodation (hotels**/***) – from RUB3500/US$58 for a double, food (meal) – from RUB600/US$10 pp; transport (public) – RUB45/US$0,7 per trip, activities (museums, boat rides, entrance fees) – from RUB700/US$11,5 pp. Upper class: accommodation (hotels****/*****) – from RUB6000/US$100 for a double, food (meal) – from RUB1000/US$17, transport (taxi) – from RUB300/US$5 pp, activities (operas, ballet) – from RUB1200/US$20 pp. *Exchange rate for January 2019 1USD=65RUB. You can check current currency conversion HERE. Map of Top 14 must-see places in St.Petersburg. 1 – Peter and Paul’s fortress; 2 – Summer Garden; 3 – State Hermitage and Palace Square; 4 – St.Isaac’s cathedral; 5 – the Bronze Horseman; 6 – Vasilevsky island and Strelka; 7 – Kunstkamera; 8 – State Russian museum; 9 – church of the Savior on Blood; 10 – Kazan cathedral; 11 – Nevsky prospect (avenue); 12 – Mariinsky theater; 13 – Trinity cathedral; 14 – Smolny cathedral. It’s difficult to decide which are the must places to visit in St.Petersburg and which aren’t but there are some ionic sights in the city that you can’t miss. All indicated entrance fees are for adults, children and students have discounts. 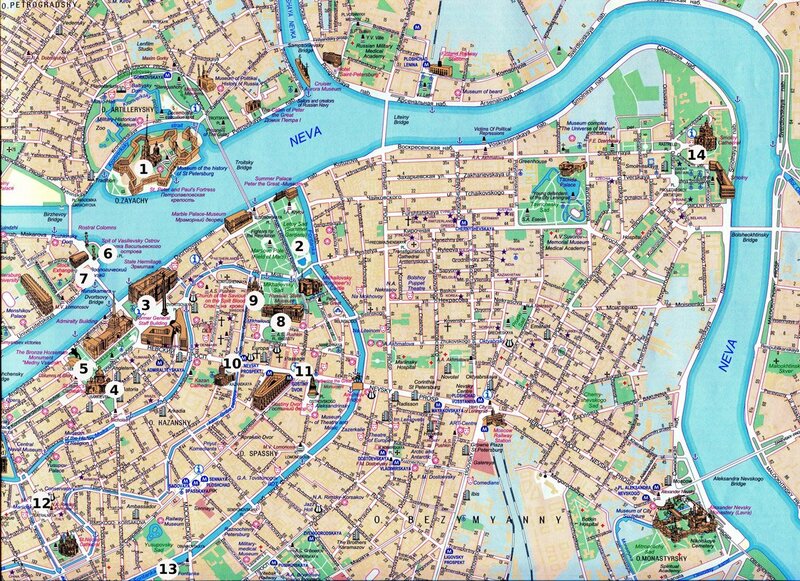 Our free printable checklist of Places to see in Saint Petersburg, Russia will be quite handy for your trip. If you want to visit the main city attractions in one day you can do a full day grand city tour that includes visit to Peter and Paul fortress, the Hermitage, St.Isaac cathedral and Church of the Savior on Spilled Blood with entrance fees, lunch, guide and transportation (mini bus) included. Peter and Paul fortress, where everything started, the original citadel of the city was founded in 1703 (official year of foundation of St.Petersburg). Metro Gorkovskaya. Entrance fee to the fortress is free. There are many different museums inside; museum of History of the city, museum of cosmonautics, Medieval torture museum etc. Interesting fact! There is a tradition Noonday gun every day at midday from a cannon fires blank shot from the Naryshkin Bastion, the tradition dates back to Peter’s the Great epoch. To know more about the city history and the fortress you can do a 2-hour guided tour. Summer Garden, was established in 1704 by Peter I and originally was planned as a place for royal residence, later become a regular park. Nowadays was restored according to the original plan. There used to be original marble statues but recently they were substituted by copies from artificial marble. Kutuzova emb., 2, m Gorkovskaya. Open 10am – 10pm from 1st April to 30th September; 10am – 8pm from 1st October to 31st March. In April the garden is closed as well as every Tuesday. Entrance free. State Hermitage and Palace square, probably the most famous places in St.Petersburg. If you have to choose only one museum to visit it’s an obvious choice. Open Tue, Thu, Sat, Sun 10.30am – 6pm, Wed, Fri 10.30am – 9pm. Closed on Mondays. Nearest metro Admiralteyskaya. Entrance fee – RUB700, students and children – free. Every third Thursday entrance is free for everybody. Attention! If you want to visit the Hermitage without crowds go on Wed or Fri after 5pm and better buy your ticket at ticket offices inside Former General Staff building (the collection of modern art, end of 19th beginning of 20th cent.). You can skip the line and do a 4-hour private guided tour this way you save time on waiting in the queue and get valuable knowledge out of your visit. St.Isaac’s cathedral, one of the symbolic building in the city, impressive from both outside and inside. If you have a chance go up to the colonnade, you’ll have a great 360 view of the city center. Isaakiyevskaya Sq., 4, metro Admiralteyskaya. Open Mon, Tue, Thu, Fri, Sat, Sun 10.30am – 6.00pm, in summer season (27th April – 30th September) 6pm – 10.30pm as well. Entrance fee RUB350/US$6. You can buy your ticket HERE. 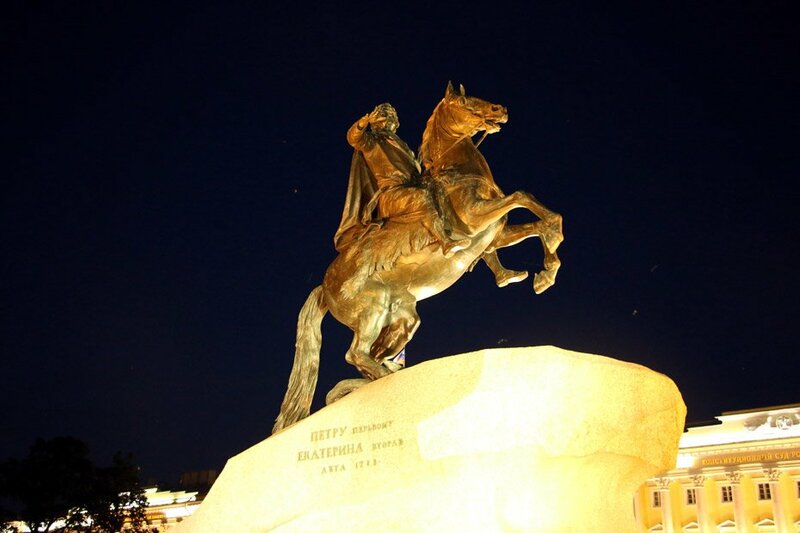 Bronze Horseman, monument to Peter the Great and the most famous monument of the city. Sentaskaya squ., m Admiralteyskaya. Vasilevsky ostrov (island) and Strelka (tip) with the Rostral columns. Tip! It’s the best place in the city to see Russian wedding with its traditional glasses breaking, on weekends there are usually quite a few of them here. Birzhevaya sq., m Admiralteyskaya. Kunstkamera, Anthropology and Ethnography museum, the oldest museum in Russia. Universitetskaya emb., 3, m Admiralteyskaya. Open; summer (June-August) Tue-Sun 11am – 7pm, rest of the time 11am – 6pm. Closed on Mondays. Entrance fee RUB300/US$4,5. State Russian museum, the names speaks for itself, here you can see Russian art (mostly painting) from Russian icons to Malevich. Inzhenernaya st., 4, m Nevsky prospect/Gostiny Dvor. Open Mon 10am – 8pm; Wed, Fri, Sat, Sun 10am – 6pm, Thu 1pm – 9pm. Closed on Tuesdays. Entrance fee RUB500/US$7,5. State Russian museum. St.Petersburg city guide. Church of the Savior on Spilled Blood, one of the iconic building of the city. Tip! If you want to take a nice photo without hundreds of people around come here early morning (5-6am) and you’ll have it all for yourself. Kanal Griboedova Emb., 2a, metro Nevsky prospect/Gostiny Dvor. Open Mon, Tue, Thu-Sun 10.30am – 6.00pm, from 27th April to 20th September there are evening excursions from 6.00pm – 10.30pm. Closed on Wednesdays. Entrance fee RUB350/US$5 (RUB400/US$6 evening sessions). Buy skip the line ticket here. 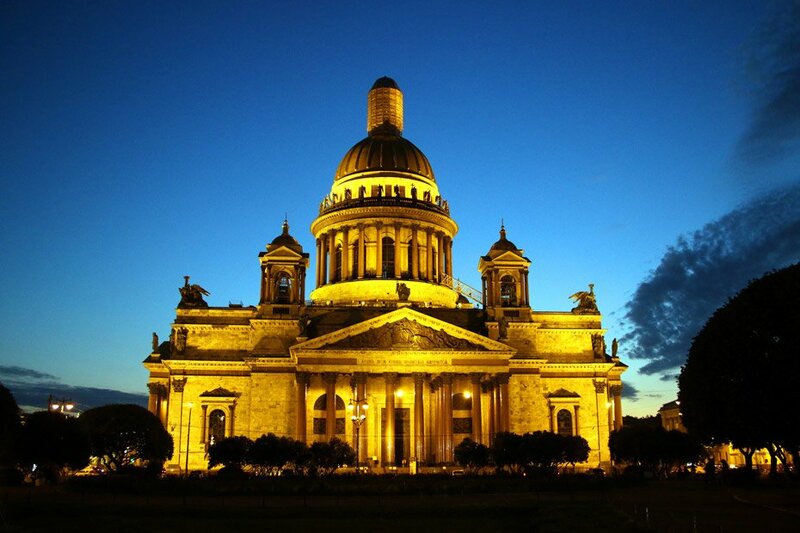 Kazan cathedral beautiful building with colonnade, one of the biggest cathedrals in the city. Nevsky av., Kazanskaya Sq., 2, metro Nevsky prospect/Gostiny Dvor. Open Mon-Sun, from 6.30am – 8pm. Functioning cathedral, free entrance. Nevsky prospect (avenue), the main artery of St.Petersburg, always busy and crowded. You won’t miss it most of city attractions are located around it. Mariinsky theater. Currently there are three stages; the Old stage – historical white and green building, right behind it the Second stage, a big modern building and 500m away the Concert Hall. All three stages are in use you can see opera, ballet or music concerts on any of them. Teatralnaya sq., 1, m Sennaya/Sadovaya/Spasskaya. Tickets from RUB700/US$11, can be booked online HERE. Mariinsky theater, Old Stage. St.Petersburg city guide. Trinity cathedral, different from all mentioned above, its huge blue dome with golden stars looks very impressive. Izmailovsky av., 7A, m Tekhnologichesky Institut. Open Mon-Sat 9am – 7pm, Sun 6am – 8pm. Functioning cathedral, free entrance. Smolny cathedral, one of the masterpieces of an Italian architect Bartolomeo Rastrelli, you can find certain similarities with Catherine palace in Pushkin. Rastrelli square, 1, m Chernyshevskaya. Open Mon-Sun from 7am – 9pm. Functioning cathedral, free entrance. This loop allows you to see almost all main city attractions. It takes between 3-4 hours to complete the route that gives you enough time to take photos and stop for a cup for coffee but not to visit any of the museums on the way. Taking this route you will see (in order from start to finish): Nevsky Prospect – Kazansky cathedral – Singer House – Stroganov palace – State Capella – Hermitage, Palace Square – Admiralty building – St.Isaac cathedral – Bronze Horseman – Dvortsovy (Palace) bridge – Vasilevsky island, Strelka – Kunstkamera – Stock Exchange – Birzhevoy bridge – Peter and Paul fortress – Troitsky bridge – Marble palace – Field of Mars – Summer Garden – Mikhailovsky castle – Mikhailovsky Garden – Church of the Savior on Blood – Russian museum – Mikhailovsky theatre. Take a boat ride through rivers and/or channels to get absolutely different perspective of the city. It’s possible to do a night boat tour as well and go under opened bridges. I’d say if you want to see the city and take nice photos do it during the day otherwise night boat it’s an interesting experience. It’s one of the must do things in Saint Petersburg in summer. Price around RUB700/US$12. Book your boat ticket here. 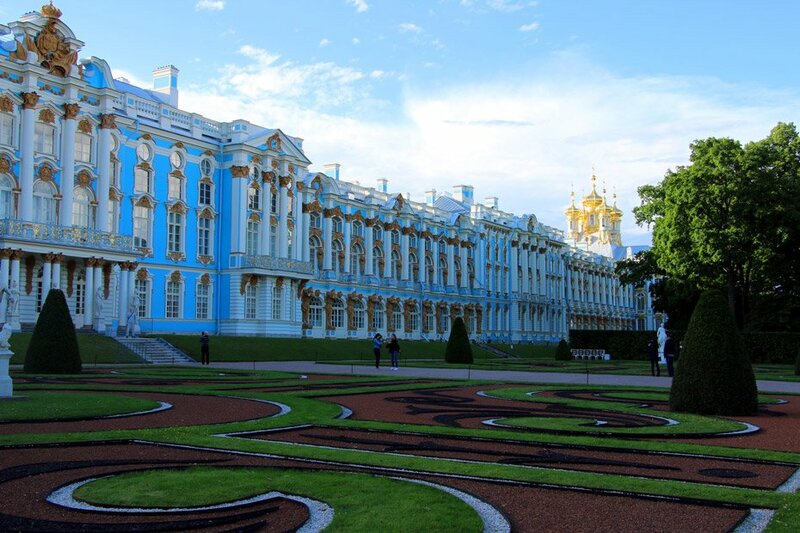 Visit at least one of the royal suburbs; the two main Peterhof (park entrance fee RUB750/US$12,5) and Pushkin (park entrance fee 120RUB/US$2). To visit one you need a whole day. 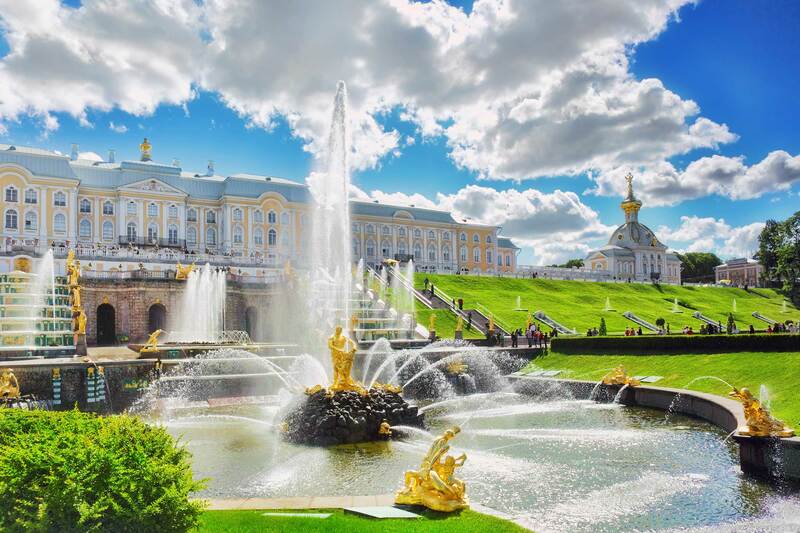 If you have to choose I’d recommend in summer (fountains are on from 20 May till 16 September) definitely go to Peterhof to see its famous fountains. Outside of summer season I’d recommend Pushkin (Tsarskoe Selo) with its Catherine palace and park which looks very impressive in winter and autumn. There are plenty of other royal residential suburbs to visit if you have enough time you can explore all of them. It’s very difficult to visit both suburbs in one day on your own but quite possible if you join Peterhof and Pushkin full day tour. See drawbridges at night. Only during navigation season from April to November with its peak in June – July (White Nights). It’s a real show with lights, music and unusual for this time of the day activity on the streets; thousands of people walking around, many restaurants and coffee shops opened all night, night boat tours and excursions etc. A great thing to do in St.Petersburg on a date night. Interesting fact! There are more than 300 bridges in the city, 13 of them are drawbridges. Tip! Make sure to stay on your island (side of the city) before the bridges open otherwise you’ll have to wait for a couple of hours to get back to your hotel. 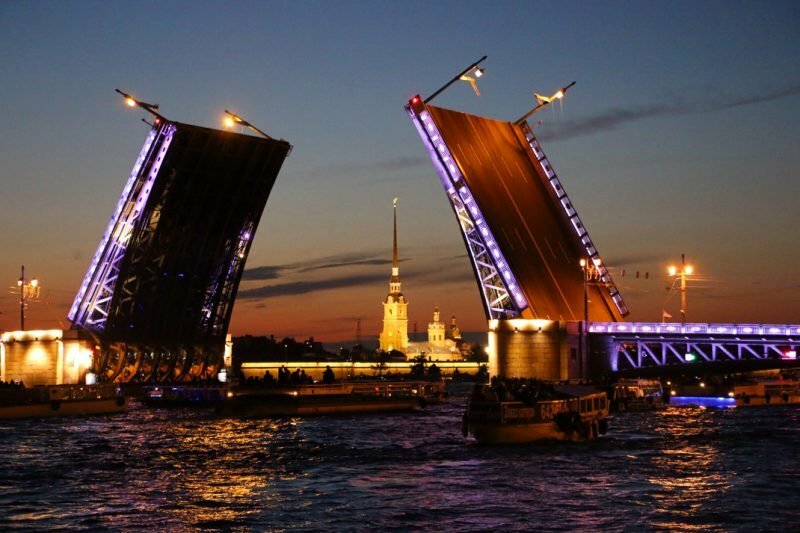 There are several tours that offer different ways to experience the White Nights in the city; Folk Show and City Night tour, White Nights Segway tour, 1-hour night boat cruise on the Neva river. 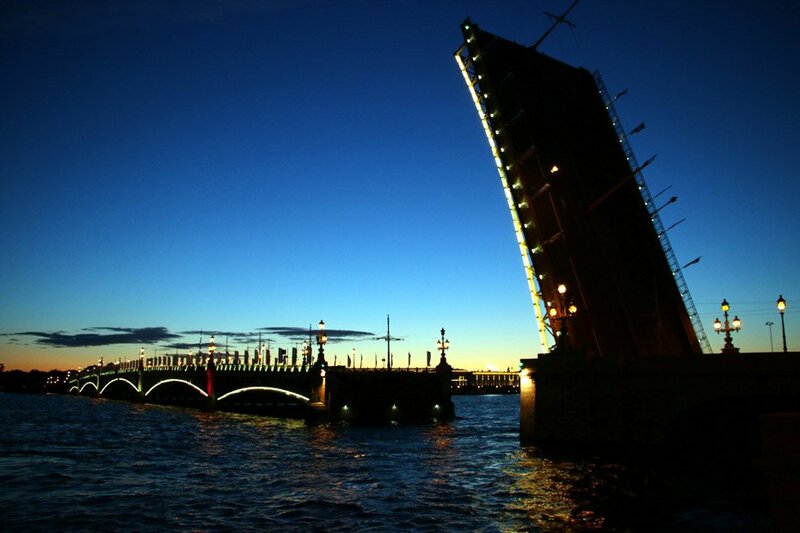 Troistky (trinity) bridge at night, St.Petersburg. Take a ride in one of the most beautiful subways in the world. See a metro map with the most beautiful stations below. Tip! It’s better to escape rush hours (7.30-10.00am and 5-8pm). If you want to go deeper in history of the underground and get some interesting details and unknown facts you can do a metro stations tour with an experienced guide. Try your luck with Chizhyk Pyzhik (siskin-reindeer from Russian), a tiny sculpture of a bird on Fontanka emb. 2. Its name originally referred to the students of the Low Collage which in its turn comes from the color of their uniform (siskin) and deer fur hats they were wearing in winter. According to the legend if you make a wish and though a coin the way it stays on the statue’s platform your wish will come true. Interesting fact! The bird was stolen 7 times but every time was found and returned to its place. Go to a classical music concert/opera/ballet, here you have a big choice; Mariinsky, Mikhailivsky, the Philarmony or one of many open air free concerts in the city center. A must do thing in St.Petersburg for a classical music lovers. Price from RUB600/US$10 pp. Explore the city on foot. St.Petersburg is a great city for walking, though some streets can get quite crowded in summer but there is always an escape to one of the smaller streets or embankments. City is good for walking any time of the day but if you want to have it all for yourself go very early in the morning between 4-5am (in June-July it’s already day light) then you’ll have a chance to take photos of empty Palace square, Nevsky avenue or Church of the Savior on Spilled Blood. You can join a walking tour to get a better idea about the city and its main sights and some helpful tips. Not a must but can be an option if you’re not a great walker or the weather is too bad, get on a famous hop-on/hop off tour bus. It takes about 2 hours to complete the whole route, you can combine bus + boat tour. 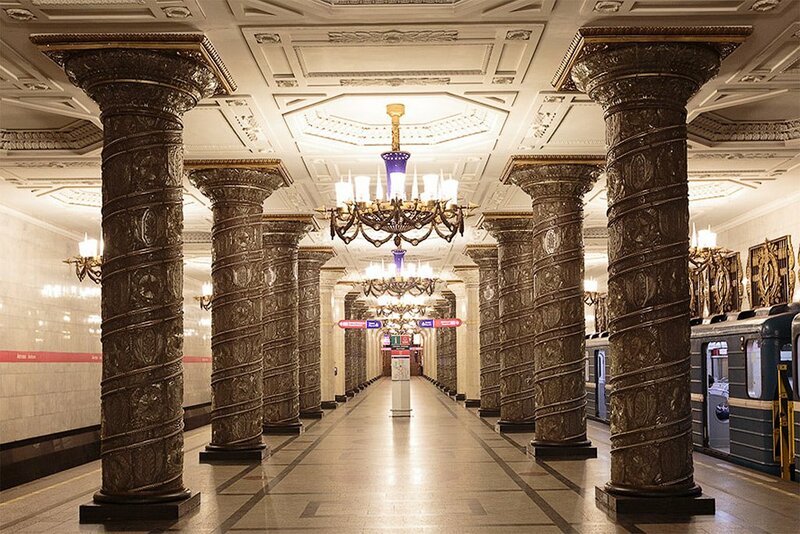 Need to know about St.Petersburg metro; you pay once to enter the metro and after that you can spend as much time and change as many trains and stations as you wish without any additional payment. So you can see all the most beautiful metro stations in one go just for RUB45/US$0,7. You are allowed to take photos in the metro but without flash. Avoid rush hours Mon-Fri, from 7.30am to 10.00am and from 5.00pm to 8.00pm it’s a very bad time for exploring the metro and taking photos. Red line: Avtovo (by the way the Guardian named it among Top most beautiful metro stations in the world), Kirovskiy zavod, Pushkinskaya. Purple line: Bukharestskaya, Obvodny kanal, Mezhdunarodnaya, Zvenigorodskaya, Admiralteiskaya (the deepest metro station in Russia and the second deepest in the world, 102m), Sportivnaya. Map of Top 10 most beautiful metro stations in St.Petersburg. 1 – Avtovo; 2 – Kirovsky Zavod; 3 – Pushkinskaya; 4 – Mezhdunarodnaya; 5 – Bukharestskaya; 6 – Obvodny Kanal; 7 – Zvenigorodskaya; 8 – Spasskaya; 9 – Admiralteiskaya; 10 – Sportivnaya. Faberge museum (Shuvalovsky palace), beautiful palace with a collection of Faberzhe’s masterpieces including famous Easter Eggs (9 in the collection) Fontanka emb., 21, m Nevsky prospect/Gostiny Dvor. New Holland, an artificial island used as minor shipyard and storage of materials for ship building. Nowadays this open-air space used for concerts, lectures, performances, festivals. There is a restaurant, coffee shop, play grounds for children etc. Open Mon – Thu, 9am – 10pm, Fri – Sun, 9am – 11pm, free entrance. Admiralteysky Canal Embankment, 2, m Admiralteyskaya. Grand maket Russia (Layout of Russia), here you can see the whole country with its regions, main attractions, landscapes etc. Open Mon – Sun, 10am – 8pm. Zvetochnaya ul., 16, metro Moskovskiye Vororta. Entrance RUB480/US$8. Mozaichny dvorik (Mosaic yard), students of Small Academy of Arts slowly but surely converting a typical yard into a copy of Park Guell in Barcelona. Open Mon – Sun, 10am – 10pm. Chaikovskogo st., 2, m Chernyshevskaya. Free entrance. Rubinsteina street a main bar and restaurant street in the city. Metro Dostoyevskaya/Vladimirskaya. Street art museum, unique museum located on a territory of a working factory. Open Tue – Sun, 12pm – 9pm. Shosse Revolutsii, 84, m Ladozhskaya, m Ploshad Lenina. Entrance fee RUB150/US$2,5. Bertgolz center, former industrial building nowadays hosts local artistic community like in the previous loft in the center you can find coffee shops, restaurants, art galleries, local designers shops and more from young and creative local community. Grazhdanskay st., 13-15, m Sennaya/Sadovaya/Spasskaya. If yo want to see modern residential areas of St.Petersburg get off at Pionerskaya metro station here you can see big multi-storey residential buildings some sort of modern urban architecture. Hermitage/Winter Palace from Strelka of Vasilevsky island, Palace bridge or Peter and Paul fortress beach. The St. Isaac cathedral from Universititskaya emb., the opposite side of Neva river. Iconic photo of St. Peter and Paul cathedral spiel between two halves of Palace bridge from Admiralteiskaya emb. Loft Project Etagi roof, view on the city center from the top. Ligovsky pr., 74. Open Mon — Sun from 9am to 11pm. Entrance to the roof RUB100/US$1,5. Solaris Lab, art coffee shop on the roof with a beautiful view on the city. Pirogova per., 18, m Sennaya/Sadovaya/Spasskaya. Terrassa restaurant, view on Kazan cathedral and Nevsky prospect. Kazanskaya st., 3A, m Nevsky prospekt. Open daily from 12pm till last guest. Mansarda restaurant, beautiful view on St.Isaac cathedral. Pochtamtskaya st., 3-5, m Admirlateiskaya. Open daily from 12pm till 1am. 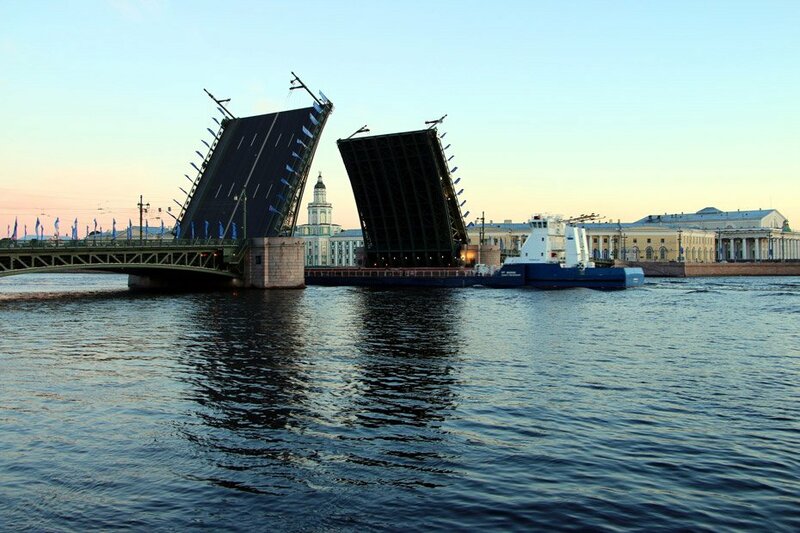 Tourists from any country can stay in St.Petersburg without a Russian visa up to 72 hours only if they arrive by ferries and follow certain rules, check HERE for all the details. We worked out a thoroughly planned itinerary in order to help you to get the most out of three days in St.Petersburg. It’s only our suggestion you can switch it any way depending on your interests, weather and time you have in the city. 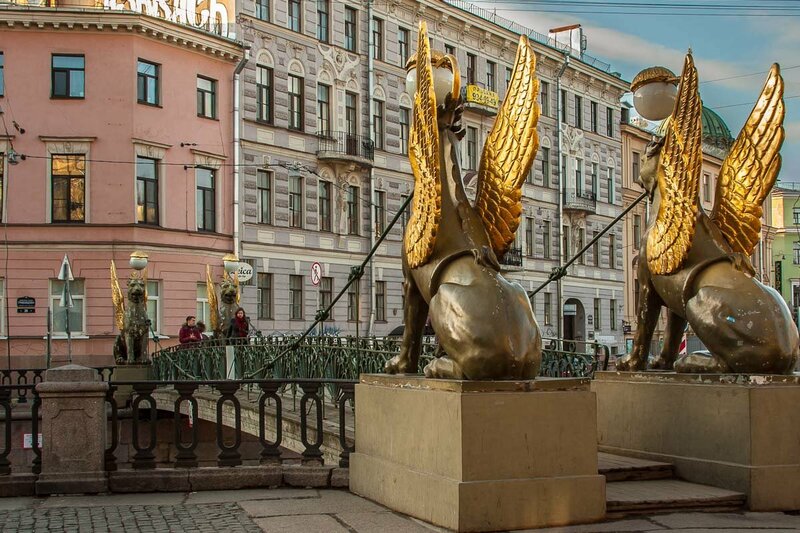 What to do in Saint Petersburg on the first day? Morning. To get know the city and to see most of the sights take a walking route, you’ll need about 3 hours to complete it. On the way you can visit a couple of cathedrals, drink coffee in one of the coffee shops. As an option you can do a city bus tour that does almost the same loop. Afternoon. It’s time for lunch, check our restaurant recommendations to find the best place for you. After lunch go underground and explore some of the most beautiful metro stations, there are many but we’d recommend to choose 4-5 otherwise you risk to spend all day in the metro. Opinion! My favorite are Avtovo, Zvenigorodskaya and Admiralteiskaya. If you have time you can check some of the sights located outside the city center like Smolny cathedral, Troitsky cathedral or maybe visit some of off-the-beaten track attractions. Evening/night. Music concert/opera/ballet in one of the theaters. Most performances start at 7pm, some at 8pm. We’d suggest to have dinner or maybe snack before, some operas are more than 3 hours long hunger can be a problem. You can buy sandwiches and drinks in any theater as well but it’ll be more expensive. After you can go to one of the busy streets (e.g. Rubinsteina, Nevsky Prospekt) to have a couple of drinks or even do a pub crawling. Morning, afternoon. Visit one of the royal suburbs, it’ll take the most part of the day so go early morning to have more time for visiting parks and palaces. Tip! Better not to plan this trip on weekends there will be too many people. Evening/night. Time to see drawbridges and White nights, the most spectacular is the opening of Palace bridge, at 1.10am after that you can walk along the embankment to one of the nearby bridges, take photos, drink coffee and go back to your hotel or stay awake all night to witness the shortest night in you life and to enjoy the tranquility of the city in the early morning. What to see in St.Petersburg on the third day? Morning. 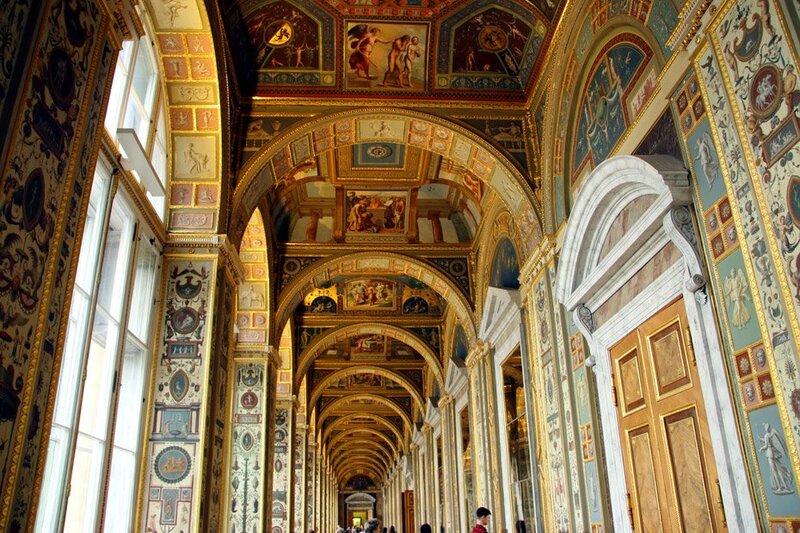 Start with the Hermitage museum, it’ll take a good part of your day, at least the whole morning. Tip! Buy your tickets at ticket offices inside Former General Staff Building there won’t be many people. Afternoon. After lunch take a boat ride along rivers and channels, usually takes between 1-1,5hours. If you feel well rested after a boat ride and ready to one more museum you can go to the Russian museum for the rest of the day. You can switch the order of visits to the museums. Just remember the Hermitage opened till 9pm on Mondays and Fridays and the Russian museum opened on Mondays till 8pm and on Thursdays till 9pm. Evening/night. You can finally chill in one of the bars/restaurants in the center your sightseeing marathon is over! It’s cheap and easy to use no need to rent a car or take taxis all the time. Metro – the easiest and fastest way to move around in the city, can get to any tourist attraction within the city. One trip costs RUB45/US$0,7 no time or station limit valid until you get out of the metro. Buses – on some streets there are separate line for buses but still in rush hours you have a good chance to get stuck, I’d rather stick to metro unless bus is the only option. Bus ride RUB40/US$0,6 any distance. Trams – the city used to have the longest tram in the world but not anymore, nowadays trams are quite scares especially in the city center. Tram ride RUB40/US$0,6. Marshrutka – it’s a commercial mini bus that in a way repeats public buses’ routes maybe a bit faster. Makes sense to take them when go to suburbs (Pushkin, Peterhof). Price between RUB40-100/US$0,6-1,6 depending on distance. There are many taxi services as well as Uber and Yandex Taxi in the city if you don’t mind paying more you can easily get a taxi anywhere any time of the day. I’d recommend to ask price before you go. From 30 April to 15 November on weekends (Friday-Saturday and Saturday-Sunday nights) there are 5 bus lines that copy metro routes, they run from 0.00 till 6am, every 30min., stop at bus stops along the route; №1M (red metro line), 2M (blue line), 3M (green line), 4M (orange line), 5M (purple line), price RUB40/US$ 0,6. Note! When the bridges are opened buses can’t cross to the other side in this case use metro. Two metro stations; Admiralteiskaya and Sportivnaya are opened on weekends from 1am till 2.40am so if the bridges are opened and you need to get to the other side you can use metro, RUB45/US$0,7. Unlike in Moscow in St.Petersburg there is only one airport, doesn’t matter if you have international or local flight they all leave from Pulkovo airport. You can easily get to/from the airport by public transport. How to get from Pulkovo to the city? The bus stop is right in front of the exit, bus leaves every 10-15min., cost RUB40/US0,6, plus the same for luggage if it’s big. Get off at Moskovskaya metro (you won’t miss it everybody will get off there). From here you can get by metro basically to anywhere in the city, at least to all touristy areas. One metro ride is RUB45/US$0,7. How to get from the city center to the airport? 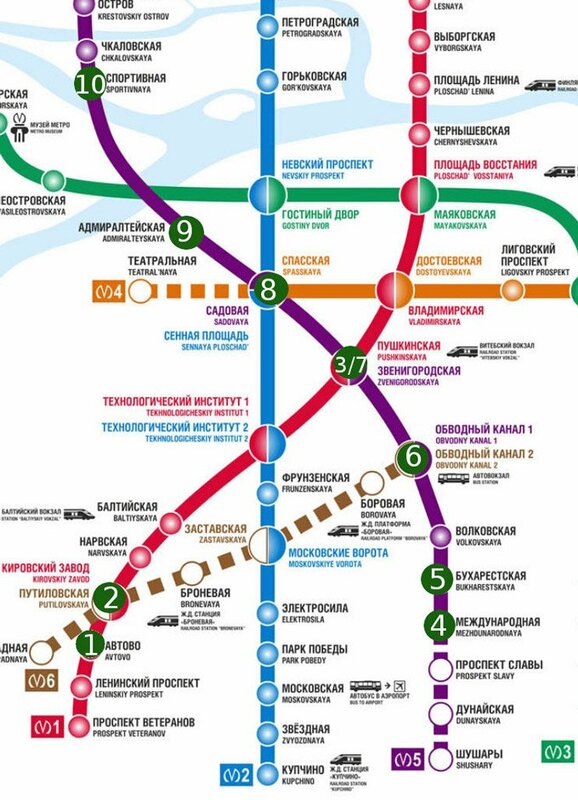 First get to Moskovskaya metro station (red line), from the center about 20min. By metro. Than exit “Bus to the airport”, the bus stop is near McDonald. From there it takes between 15 to 30min. to get to the airport depending on traffic (from 5pm to 8pm the worst). So if you know the way it’ll take between 1-1h15min. 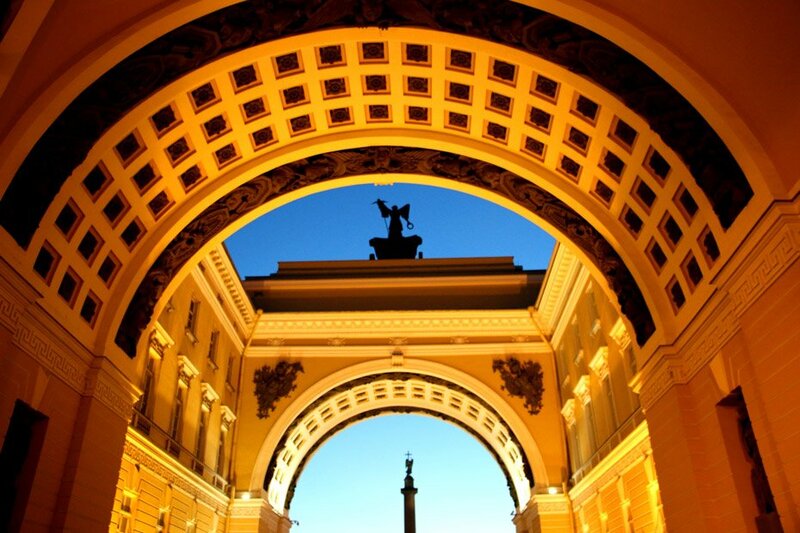 Arch of Former General Staff building, Palace square. If you want to go to Moscow, to most southern destination. Speed train Sapsan St.Petersburg – Moscow leaves from this station. As well as most trains to Moscow and Southern destinations. Nevsky prospect, 85, m Ploshad Vosstaniya/Mayakovskaya. Trains to Northern parts of Russia like Vorkuta, Chelyabinsk. Trains Moscow – Murmansk stop at this station. The newest railway station in the city. Zanevsky prospect, 73, m Ladozhskaya. The only one long distance train that leaves from here is speed train Alegro to Finland. The rest is suburb trains to local “resort” areas in the North of the city like Zelenogorsk, Vyborg, Priozersk, Ladozhskoe lake etc. Interesting fact! In April 1917 Lenin (father of Russian Revolution) returned from his auxiliary and arrived at this station here he made his famous speech announcing social revolution. Where to do shopping in the city center? The best and the biggest is Galereya, a huge mall right in the city center on Ligovsky prospekt, next to Moskovsky railway station and Nevsky avenu. Here you can find anything fancy clothes shops, H&M, good variety of restaurants and coffee shops, ATMs, sport shops, and a supermarket OK on the ground floor. Ligovsky prospect (avenu), 30A, m Vosstaniya and Mayakovskaya, open Mon – Sun, 10am – 11 pm. TK Pik there are some shops as well but in a much small scale the good thing about this mall there is a big supermarket Perekrestok on the ground floor here you can stock your food supplies. Sennaya sq., 2, m Sennaya/Sadovaya/Spasskaya. Open Mon – Sun from 10am – 10pm. Where to eat in St.Petersburg? The most budget is to cook for yourself but anyway there are some pretty cheap and ok places in the city center. Чайная ложка/Chainaya lozhka (Tea Spoon) – local pancake place, all sort of pancakes with different fillings, salads, soups, tea, cool drinks. Meals from RUB150/US$2,5. Many around the city. Nevsky prospect, 44, m Nevsky pr./Gostiny Dvor. Nevsky prospect. 85, m Mayakovskaya. Open 24 hours. Сел — Поел/Sel – Poel (Sit down and Eat) – all sort of food from traditional Russian meals (buffet bar with salads, sides, soups and mains) to pizza, wok, burgers, steaks as well as desserts and coffee. Average bill RUB300/US$5. Sadovaya st., 27, m Sadovaya/Sennaya/Spasskaya. Open Mos-Sun, from 9am – 11pm. Пироговый дворик/Pirogovy Dvorik (Pie Yard) – traditional Russian pies with meat, chicken, vegetables, berries and more, they serve as well soups and salads. Breakfast from RUB130/US$2, lunch from RUB210/US$3,5. Griboedova emb., 22, m Nevsky Prospect. Open from 10am to 11pm. Теремок/Teremok — one more local pancake place with a big variety of pancakes, soups, salads etc. Set meal from RUB150/US$2,5. There are many around the city, e.g. Nevsky prospect 60, Bolshaya Morskaya, 11. Open from 7.30am – 11pm. Doughnuts on Bolshaya Konyushennaya. Not really a food place only doughnuts, tea, coffee but it’s the oldest doughnut place in St.Petersburg and they try to keep it the way it was during Soviet area, my mum used to go there when she was at school and it looked and served the same. THree doughnuts with coffee will cost RUB120/US$2. Tip! Go there before lunch time otherwise it’s very likely you’ll spend some time in the queue. Bolshaya Konyushennaya, 25, m Nwevsky Prospect. Open from 10am – 8pm. Subway, KFC, McDonalds all these are quite cheap, Sub of the Day you can get for RUB125/US$2, Cheese burger RUB60/US$1. We always try to eat in local places but in sometimes fast food can be an option. Pelmeniya – mono cuisine restaurant, all sort of pelmeni (Russian dumplings), momos, khinkali from around the world. Nice cozy place, good food, English menu. We’d recommend to come here for lunch to make a break in exploring the city. Average bill RUB400-600/US$7-10 per person. Fontanka emb., 26, m Nevsky prospect/Gostiny Dvor and Marata st., 8, m Ploshad Vosstaniya. Open from 11am – 11pm every day. Suliko – Georgian cousin, house wine, English menu, one of our favorite restaurants in the city. Tip! Try khinkali, Ajarian Khachapuri, shashlyk (a typical Georgian/Russian way of cooking meat on fire). Average bill RUB500-700/US$7-10 per person. Kazanskaya st., 6 behind Kazan cathedral, m Nevsky prospect. Open from 11am – midnight every day. Ukrop, vegetarian/vegan/raw food, everything from starters to desserts, breakfast menu. Very cozy chilled place, English menu. Average bill RUB500-600/US$7-10 per person. Malaya Konyushennaya st., 14, m Admiralteiskaya. Open from 9am – 11pm every day. Bakhroma, Uzbek cuisine, breakfast and lunch menu, meat dishes, soups, dough dishes. Average bill RUB500-700/US$7-10. Bolshoy prospect, 30, m Sportivnaya/Petrogradskaya. Open from 11am – 1am every day. Bekitzer, Izraeli street food bar. Rubinsteina st., 40, m Vladimirskaya. Average bill RUB500-700/US$7-10 only shawarma/falafel will cost you about RUB300/US$5. Open from 12pm – 6am every day. 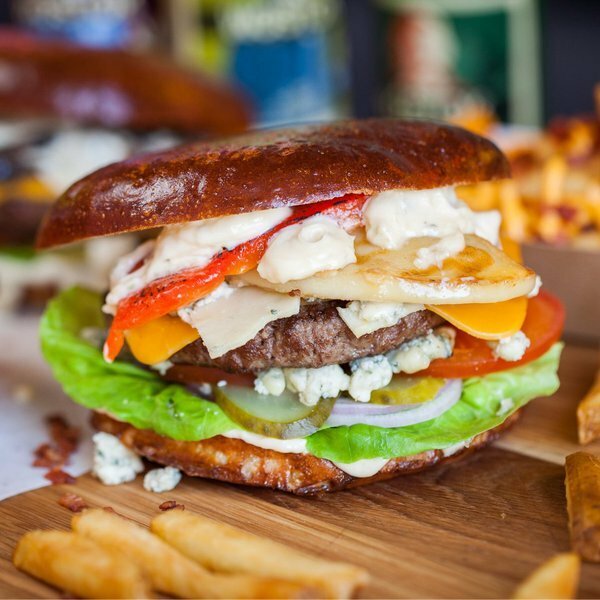 MooMoo Burgers, the best burgers we’ve ever eaten, English menu. Tip! Try Cheese blast it’s the best. Average bill RUB500-700/US$7-10 per person. Sadovaya st., 42, m Sadovaya/Sennaya/Spasskaya. Open from 8am – midnight every day. Cheese blast, the best burger ever! Moo Moo burger restaurant. In this price range we haven’t visited any restaurants (too much for our budget) our recommendations are based on reviews from local magazines/websites and my friends’ opinion. KoKoKo, modern Russian cuisine restaurant with creative menu, using seasonal products from local farmers. Average bill from RUB1500/US$25 pp. Voznesenzky prospect (av. ), 6. Open Mon – Fri from 7am-12pm, from 2pm-1am. Sat – Sun from 7am-11am, from 2pm-1am. Tip! Try their famous dessert My mother’s favorite flower. Полный Балет/Polny Balet (Total Ballet), modern interpretation of old Russian cuisine. Average bill from RUB1000/US$16 pp. Gorohovaya st., 4, m Admiralteiskaya. Open daily from 10am-11pm. Вкус есть/Vkus Est’ (Taste to Eat), Traditional and modern Russian cuisine. Average bill from RUB1500/US$25 pp. Fontsnka emb., 22, m Pushkinskaya/Zvenigorodskaya. Open daily from 1pm – 111pm. Food park, fusion, European, Asian, Indian cuisine. Average bill RUB1500/US$25 pp. Alexandrovsky park, 4/3A, m Gorkovskaya. Open Mon – Fri from 11am – 1am, Sat – Sun from midday – 1am. Panorama restaurants mentioned above in Best Photo spots section. Average bill RUB1500/US$25 pp. Weather in St.Petersburg is unpredictable, it can change from warm and sunny to cold in windy in a day so my advise bring some warmish clothes (hoodie, jeans, trainers) as well as summer clothing. Comfortable shoes/sandals for walking – you’ll be walking a lot; around the city, in the museums and parks make sure you have a pair of comfortable shoes. Umbrella – it can rain any time in this city. Hoodie/sweater – even if it’s warm during the day you’ll need something warm to wear at night time. Jeans (ladies’ option) – for the same reason as a hoodie. Travel backpack – for hand luggage (to pack your laptop, phone, documents etc.) and to use as a day pack in the city. Sunglasses – yes, it can be sunny in the city and if you do any water excursion sunglasses will be quite handy. LifeStraw – tap water is not good for drinking (at least nobody I know drinks it unless there is a filter) bringing a LifeStraw bottle of just a filter is a good idea. I intend to visit St Petersburg in middle of Sept. Any tip? Hello, Joe! Mid September is a great time to visit St.Petersburg, the weather is nice and sunny, not as many tourists as in June-July. I’d definitely suggest to visit royal suburbs Peterhof (fountains are on till 21st-22nd of September) and Tsarskoye Selo (Amber room and Catherine palace). Don’t miss bridge opening at night though in September the nights are quite dark already compared to summer months but it’s still beautiful. Take a boat tour through the city center, definitely visit the Hermitage, St.Isaac cathedral and Church of the Savior on Spilled Blood. 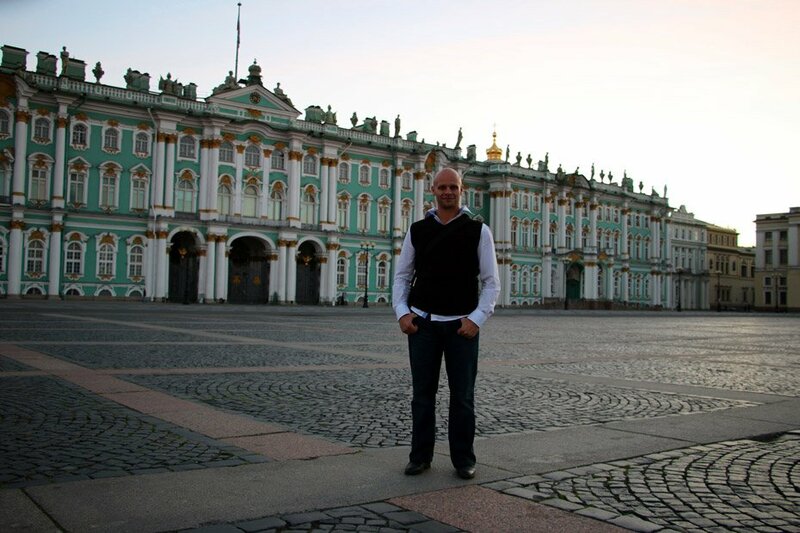 I am planning a 3 day trip to St. Petersburg Russia at the end of April. What is the easiest way to get the invite for the visa? Hello, Kirk! We’ve never used any agency or company to get an invitation because we don’t need visa for Russia but from what I’ve heard from other tourists I guess the easiest way is to use a local agency in your country that does visa services, they’ll arrange the invitation and all the necessary paperwork for you. Hello – visiting for a week during first week in May and love all you great info. I was trying to copy and paste some of your info into my own travel planning documents, but unable to highlight and copy – am I doing something wrong?? Hello, Joyce! The best solution is to take a screen shot we can’t fix the problem right now because we’re busy hiking in Nepal and don’t have good enough Internet. Sorry for the inconvenience! I hope you’ll have a great time in St.Petersburg! Anyway, when students FREE, do shops accept student card issued by school/ university or should students have international cards? Hello, Zuzana! Thank you for the comment! Free entrance to the Hermitage is used to be on firth Thursday of every month but from 1st January 2019 they changed it to the third Thursday. I wouldn’t recommend to go to the museum on a free entrance in summer day you’ll spend 2-3 hours waiting in the line outside. Tuesdays are not great as well because the museum is closed on Monday there are twice as much people on Tuesdays. The best days for visiting in season are Wednesday and Friday evening when it’s opened till 9.00pm. As for student cards it doesn’t specify anything about international cards. I just read some threads in TripAdvisor forum and people say they could get a free ticket with their local student/school card. I had a friend from New Zealand who works in a museum he showed his local museum card and got a free ticket. Hope you’ll enjoy your trip to St.Petersburg! Hi Thanks a lot. Got to know many things. Im planning to visit this December 22nd to 24th. Got many suggestion to buy St Peterburg card for 3 days. What do you suggest?. Also heard that many boat rides/canal rides are closed in December. Is it so? Hello, Vinuth! Thank you for the comment! The Card looks like a good deal but some of the included activities are not available in December like boat cruise, hydrofoil to Peterhof basically anything water related, the navigation season in the city is closed in winter, most of the river are covered with ice. The drawing bridges are not opened in winter either. Entrance to the Hermitage is not included in the Card, it’s a must visit museum in St.Petersburg you’ll have to pay extra. Not sure if you’re a student or not most museums have special prices for students (international as well), if you’re bring your student card with. Public transport is not included but you can recharge the Card and it’ll be a bit cheaper than buying tokens though one metro trip is only 0.80US$. If you’re planning to visit several museums, palaces and cathedrals it’s worth buying but if you’re going only to two or three it might be not worth for you. If you want to visit one of the royal suburbs in winter I’d recommend Tsarskoye Selo (Pushkin), the fountains in Peterhof are closed and it gets quite cold and windy there from the gulf. Thank you so much for all the info. I really need these before my trip this end of the month. I am sure it’s going to be very cold. I will spend my New Year’s Eve in St. Petersburg? How’s the crowd there during New Year? Any additional tips? Hello! Thank you for the comment! Usually it’s not very cold in St.Petersburg in December, between -5C and -10C. Over December holidays the city gets quite busy but it’s a nice festive vibe with Christmas markets, decorations and many events happening around. If you’re planning to visit any concerts or performances during your visit I’d suggest to buy tickets beforehand as well as to book your accommodation, the best and cheapest places might be full for that period. Enjoy New Year in St.Petersburg! Excellent guide! Thank you very much guys, will follow from now on. Hello, Tania! Thank you very much for your comment! We hope you’ll find more helpful information on our site. Very detailed but easy to follow as well. Thanks for the perfect job. I’ll follow you now on. Hello, Yucel! Thank you very much for your comment! Hope you’ll have a great time in Saint Petersburg. Hi guys! Thanks for all the details you gave here. I cited you on my latest blog post about Saint Petersburg. Hi, Juliana! Thank you very much for citing our post on your blog! We’re happy you’ve found it helpful and informative! 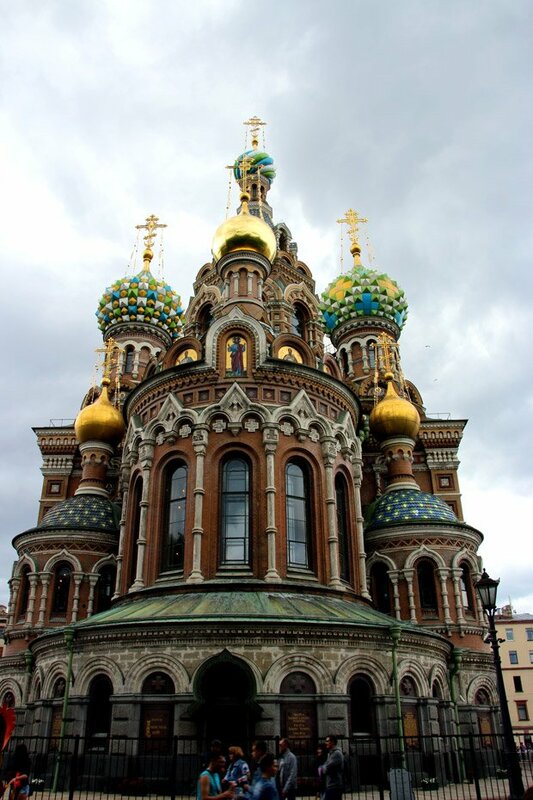 This is an exceptional guide for St Petersburg which I really enjoyed reading, Campbell and Alya! I really hope to use it soon. Hello, Junie! Thank you very much for the comment! We’re glad you found our post useful! A beautiful and very detailed story about St. Petersburg! I think this is very useful information for our guests. Thank you! Merry Christmas! Thank you, George! Merry X-mas! Thank you for this detailed guide. I have saved it to help me plan some ideas for my trip in October. Hello! Thank you for the comment! In October you’ll have no tourist crowds it will be quite easy to get to any museum, all the theaters start their season in October so you’ll have a big variety of concerts, operas etc. If you have any questions we’ll be happy to help! The ultimate guide to St. Petersburg, the name stands so true. Amazing article, detailed and thorough. You have covered everything. The pictures are amazing too.